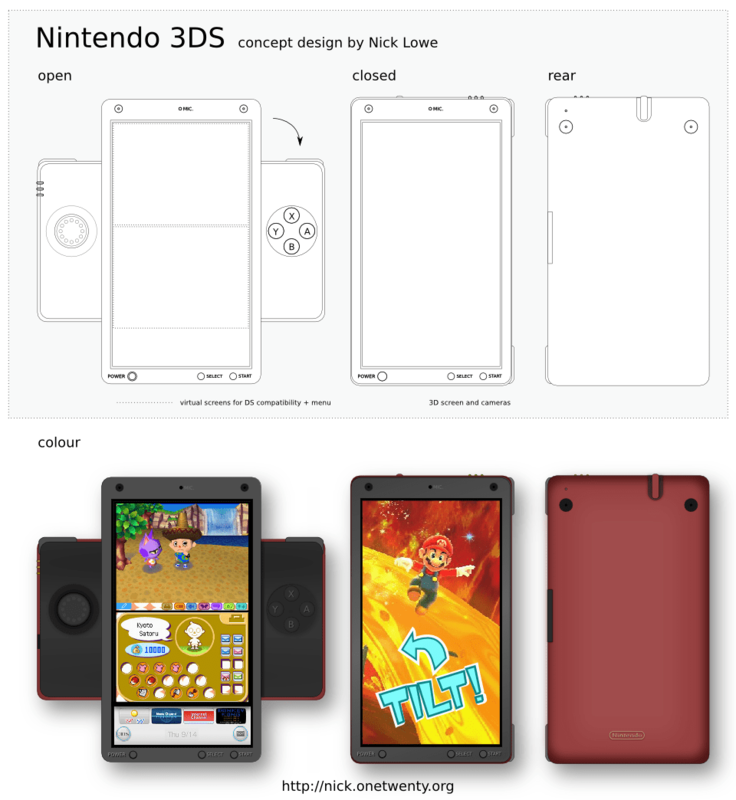 Nintendo 3DS concept design – Nick. Nintendo recently announced that their new handheld (currently dubbed the 3DS) will be released sometime over the next 12 months. Be backwards compatible with DS and DSi game titles. Feature a screen that produces 3D imagery without requiring special glasses. Include orientation and motion sensors, and vibration feedback. Feature a special 3D joystick. I’ve enjoyed seeing the design ideas coming out of this thread on NeoGAF, but I’m not entirely bought off on any particular design (yet). As is my want, I’ve been playing around with different concept designs. A vertical tablet has appeal to a wide audience (ebooks, crosswords, etc.). Dual cameras could be used for 3D photography/video with the 3D screen. Nintendo may focus on cameras, motion, and touch over “legacy” controls. “Classic” controls should be available for the traditional gaming audience. Update: Minor fixes (mostly lightness). Hey Nick, sweet design – love the “+” shape! Hi, that’s design is better than old ones I think, but is it safe enough for the screen? Somehow we must protect it.